Well said, Grant! The Red Line would truly be the “shot of investment” Baltimore City needs to fuel job creation and training, energize redevelopment and investment, and break down barriers social and economic barriers across the city. This generic defense says absolutely nothing about the merit of the Red Line, which in reality would be a $2.5 Billion bloated boondoggle of cheap disconnected tinkertoy transit. The west leg would be slower than existing express buses. The east leg would be 70 feet below ground where what’s needed is a short distance streetcar or shuttle service that one could just hop onto. The Red Line’s ridership numbers were rigged by a convoluted feeder bus system and the absurd assumption that over 60% of the entire region (5 county) growth would occur within the line’s two mile strip. Those numbers were cooked up AFTER all the other alternatives were ruled out. Just look at the MTA’s sorry track record. Decades later, there’s still no transit oriented development at Howard Street or Westport, just vacant lots and crumbling buildings. This is a great argument for more and better transit options in general, but I think it’s clear that MTA and the state have once again shot for the moon before we’ve even managed to get into orbit. Here are things MTA could do with less money, less time, and less disruption to make existing transit more useful to the entire city (not just people along the path of the Red Line). Many of these things have been promised for years and have yet to be delivered, and many others don’t even seem to be on MTA’s radar. 1. Real-time arrival info for all buses and existing trains, with signs at all train stations and major bus stops. -Creates limited stop regional lines with high frequency that use buses which are clearly differentiated from local buses (different paint job and numbering system). Each regional line stop should be treated as a major stop, with a shelter, electronic sign for real time info, a ticket purchasing kiosk, and a specially branded sign that matches the special branding on the buses. These regional lines should mimic the proposed transit lines in the Regional Transit Plan (which probably also needs to be updated). -Creates much shorter local routes that have a higher density of stops and feed riders into the regional bus lines (as well as metro and light rail stations). -A simple, easy to read transit map that shows the rail and regional bus lines, with neighborhood maps at each major stop which show the local routes available at that stop. 3. Real on-time statistics that count buses which have been pulled from service for mechanical or driver issues (which the current statistics don’t). 4. A task force whose sole job is to evaluate current data on system performance and make recommendations to increase the reliability of the system. This task force must have authority behind its recommendations so that they cannot simply be ignored. These changes alone, if implemented correctly, would make Baltimore’s transit system several orders of magnitude more useful and appealing, especially to the middle class, who have all but abandoned MTA in its current form. The increased ridership that resulted would make the case for new train lines much easier. To be frank, after trying to use MTA to get around the last 4 years, I have absolutely no faith that can plan, design, engineer, build, and run a 3rd transit line. If they were able to successfully implement the steps I outlined above, I would have much more faith in their ability to properly manage an expansion of the train system in Baltimore. Unfortunately, your general assessment of MTA is correct. MTA is slow to adopt best practices and new productive technologies. You are also spot on that MTA’s performance has soured the view of many on transit and has not been a catalyst for TOD like in other cities. That being said, Baltimore has a once in a generation opportunity to build a new line. If this opportunity right before us vanishes, there will be no new lines for at least a decade. If the Red Line is funded or not, we need MTA to become a better operator and Baltimore needs to figure out a way to get more development around its stations. 1 – The Red Line’s planned feeder bus network is diametrically opposed to the kind of efficient hierarchical structure he sets forth. The Red Line corridor bus lines would have major redundancies with the Red Line and the excessive route lengths would remain. Riders would be torn between staying on the buses or transferring to the Red Line (and often back to buses again), which would be too slow, disconnected and low capacity (maximum 2 car trains) to lure riders on its own. Another huge inherent problem is that the Red Line corridor is far too narrow for a good feeder bus network, with Leakin Park, major cemeteries and the southeast waterfront occupying far too much of its ridershed area. The MTA needs an integrated bus-rail system proposal that will work with the Red Line, and they just can’t do it. 2 – The MTA’s 2002 long range rail transit plan is now totally dysfunctional. The MTA already tried to plan for extending the subway north of Hopkins Hospital, which was previously as high a priority as the Red Line, and they failed. The BRTB plan put in a modest extension to North Avenue by 2035, but the MTA study also failed to show this was economically feasible. And even if it was, the MTA study showed it could not be extended to Morgan or anywhere beyond, There is now no feasible path to ever get to Perry Hall, White Marsh, Middle River or Dundalk with either the Red or Green Line. The MTA Red Line planning has failed to physically or operationally accommodate any other system extensions at any locations, including the central corridor Yellow/Blue line to Towson. This is not a new problem. It is chronic to the existing subway and light rail lines as well, which is why there is no accommodation of a west branch off the subway north of Lexington Market as was called for at the time (the 1970s). So the real question is: If the state does somehow figure out how to find $2.5 to $3 billion for the Red Line, will that be the LAST SIGNIFICANT RAIL TRANSIT we’ll ever see in Baltimore? Or is this a case of the MTA “shooting for the moon before we’ve even managed to get into orbit” as Humanamerican aptly states. What Baltimore needs is a far more modest but integrated rail project that actually works. Not the Red Line. Contrary to what the writer, Grant Corley asserts, March 2013 is NOT make-or-break time for the Red Line and other state transportation projects. This kind of alarmism leads to major transportation projects which poorly conceived, not wanted, or not needed. The Baltimore Metro Area has a lot to gain from projects like the Red Line, or, as proposed with the Red Line back in 2002, the Green Line or the Yellow Line. However, as currently proposed, the Red Line has a great deal of room for improvement. If we are going to finance and build such a substantial public works project which our children’s children’s children are going to have to use and live with, then let do it right! There needs to be much more and much better system-wide long-range planning of transportation in the Baltimore Metro Area, to include vast improvements to our bus system, and alternatives to both light and heavy rail, such as widespread use of streetcars. Baltimore used to have a high-functioning trolley system. Some new, walkable cities in the US are returning to this. The people and businesses of Baltimore deserve a more comprehensive approach to the planning of transportation – one which actually engages them from the outset. Public engagement in transportation planning means more than venting at public hearings about pre-planned proposals handed to the public for their “input,” comments, or reactions. Human American brings up some good points about the MTA and as someone with insider information I want to respond to them. 1. The MTA has been working on a real-time arrival system for several years now. What’s made implementing it so difficult is that unlike almost every other major transit system in America, the MTA is an arm of state government rather than a separate authority with its own board. This means the agency has to deal with way more red tape than most other transit agencies. 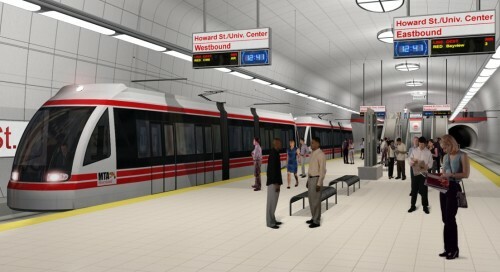 For example, when the MTA wants to purchase new equipment it must first go through its own procurement process, then it must have its purchases approved by MDOT, after that it must be approved by the department of budget and management, until finally the board of pubilc works issues its final approval. WIth such a cumbersome process, it’s amazing the MTA actually manages to purchase anything. From what I last heard the MTA hopes to get its real time arrival system up by this summer. But I’m not holding my breath. 2. These are all good ideas. The problem is that since the MTA is an arm of state government not an independent authority everything it does is fraught with politics. And redesigning the bus system is a very difficult thing to do since someone will always be unhappy no matter what you do. I think we also need to remember that there was a major bus system redesign (GBBI) during the early 2000s. But it was done under Governor Ehrlich and was more about squeezing money out of the MTA than it was about creating a better bus system. Your suggestions about more limited stop buses and enhanced bus stops are very good ones. But they require money to implement. Money the agency does not have. 3.This isn’t completely true. While on time statistics may not include breakdowns and runs that are cut, the MTA does keep track of breakdowns and cut runs. I think these make up roughly 1 percent of all MTA scheduled runs. You can see it for yourself on statestat. This being said, if the MTA really cared about being transparent and communicating with the public they would put these stats on their website for everyone to see. 4.The MTA has its own task force that does exactly what you’re talking about . In fact it was based on the recommendations of said task force that the MTA consolidated stops on the 11 and 35 lines and also adjusted the schedules on these lines. The task force also really, really wanted to increase frequency on the 35 but was unable to due to funding restraints. I find it inexcusable that the MTA’s marketing and communications department did not communicate this to the general public. It doesn’t matter how much power you give this task force if the agency does not have adequate funds to fulfill its mission. Most of this comment has been dedicated to discussing the outside restraints on the agency. However, I do believe there are cultural issues within the agency itself that need to be addressed if transit is to improve. Overall, I’d argue that the conversion of the agency into an independent authority with its own board that can both advocate for the agency and make it accountable to the public along with more funding will go a long way towards improving things. PS. It is interesting to note that many of the agency’s critics are also strong supporters of the Red Line. Let’s remember that many of the forces pushing for Red Line construction are the same folks who are responsible for the way things are today. I’m neither for or against the Red Line but I thought I’d point this out. Greg, the “red tape” problems are experienced by every state agency, not just the MTA, so they need to be addressed by the state, not escaped by becoming an independent authority. Most urban transit agencies would LOVE to have the resources of the entire state, and a strong natural alliance between the Baltimore and DC regions. (Look at chronic Philly and Pittsburgh funding woes). And conversely, many anti-transit people would love for the state to rid themselves of the MTA to save money. Blaming money issues is a bad excuse. MTA funding and deficits have skyrocketed. They’ve had no problem defying legislative mandates for farebox recovery. The whole Red Line with the scrapped 2002 regional rail plan was a product of an “independent” task force that had no problem with coming up with ridiculously expensive unworkable projects that could never be funded at any level, regional or state. They pretended the Red Line could be built for around a billion, and the fact that it is headed for $3 billion and most of the 2002 plan has already been scrapped cannot be blamed on the state legislature. I can’t help but agree with many of the comments above. For that reason, I’m going to side with Gerald and B’more here…it’s waaay easier to deride the MTA in the blogosphere and then when anything is proposed to improve the system…do anything and everything to obstruct those improvements from taking place. This is “comeback” city as in renaissance not retort, right?